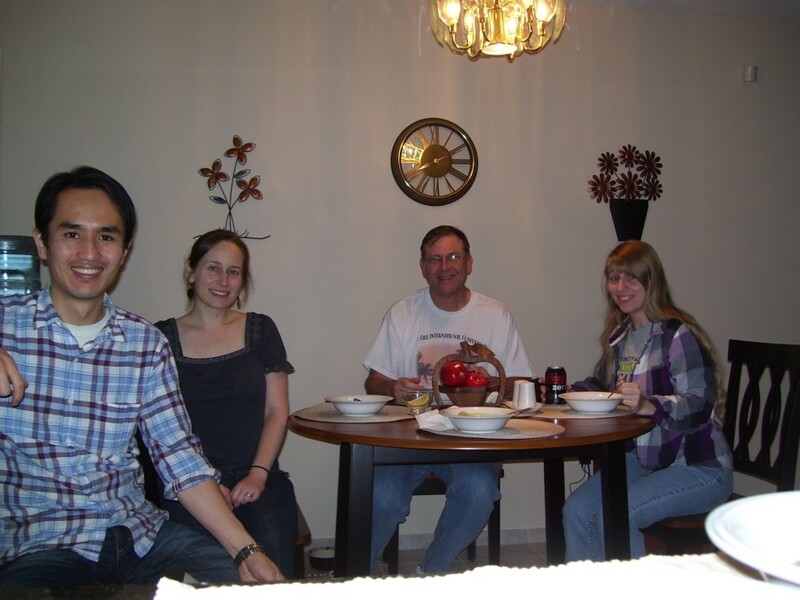 SwankiVYPics: December 2012 to January 2013 with Patricia and Yusuke! 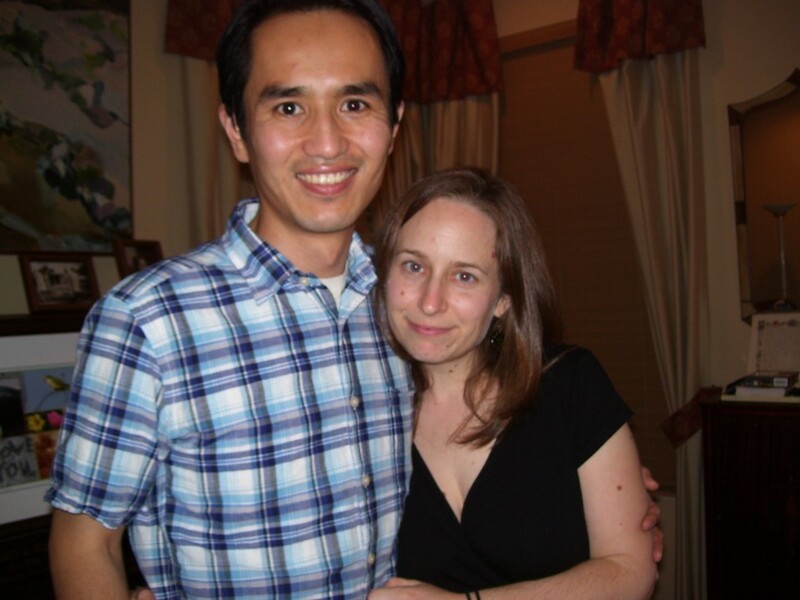 My sister Patricia came to visit on Christmas Eve, 2012, with her husband Yusuke! We were able to spend the last week of December and a couple days of the new year together, enjoying some great family time! xmasbrunch1.jpg: Here are Patricia and Yusuke digging into the lovely smorgasboard of my brunch on Christmas morning. xmasbrunch2.jpg: This is the food. 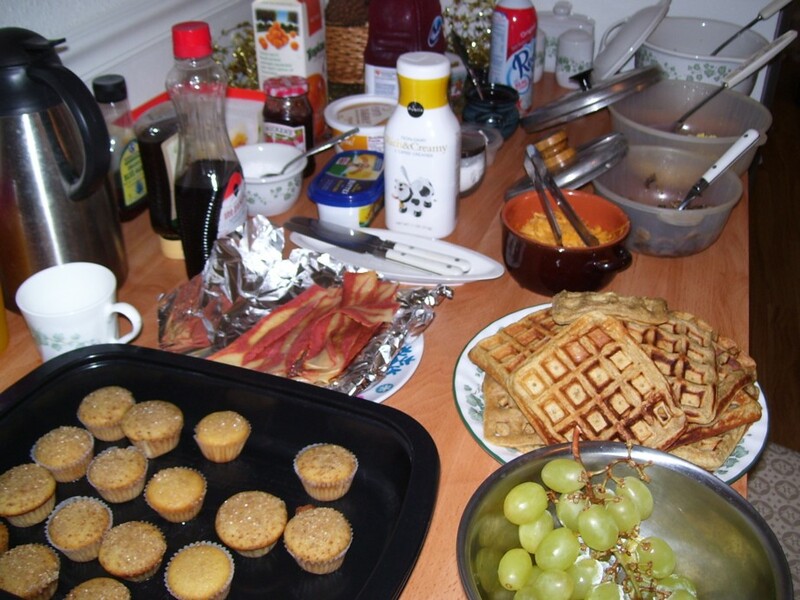 We had homemade whole grain waffles, scrambled eggs, breakfast potatoes, grapes, soy bacon, homemade orange sugar muffins, and coffee. Mmmm! 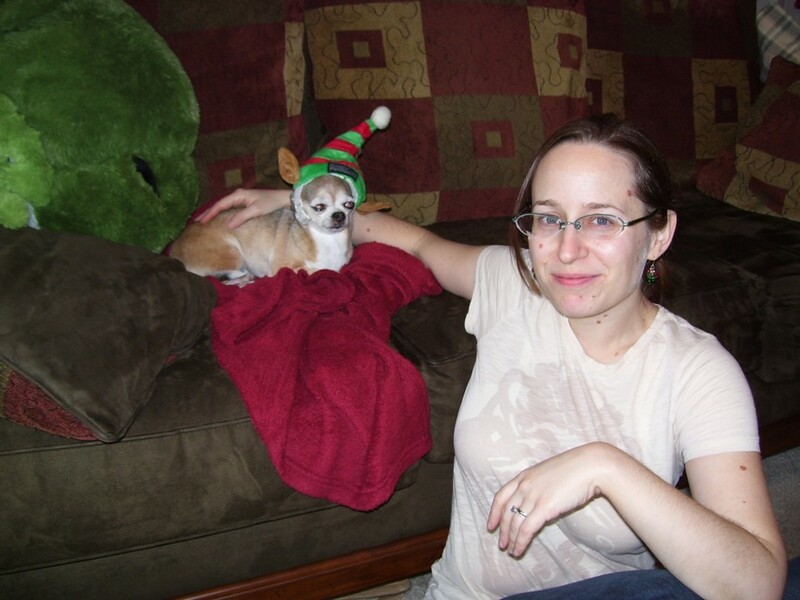 xmasbrunch3.jpg: Lindsay brought her doggie Pork Chop, and this is Patricia chilling with her. xmasbrunch4.jpg: The whole crew on the couch! 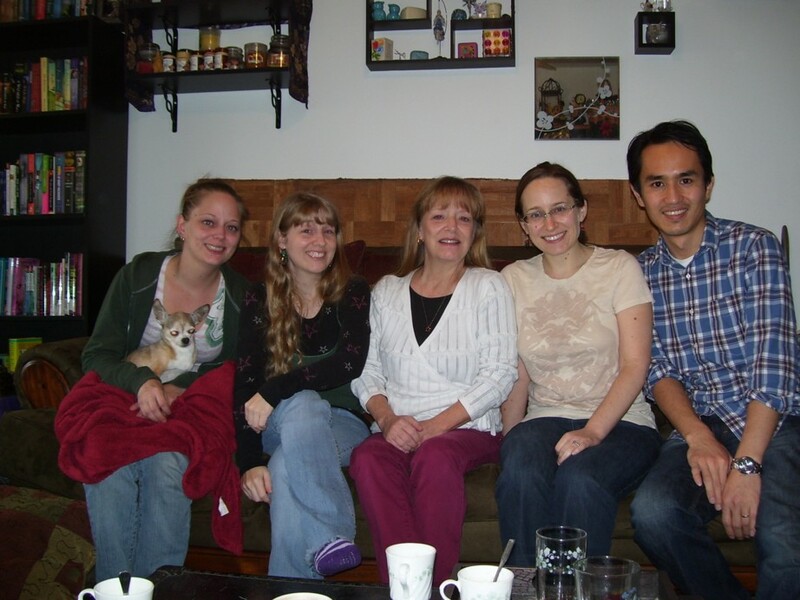 Lindsay, me, Mommy, Patricia, Yusuke. xmasbrunch5.jpg: Then the gift-giving started. 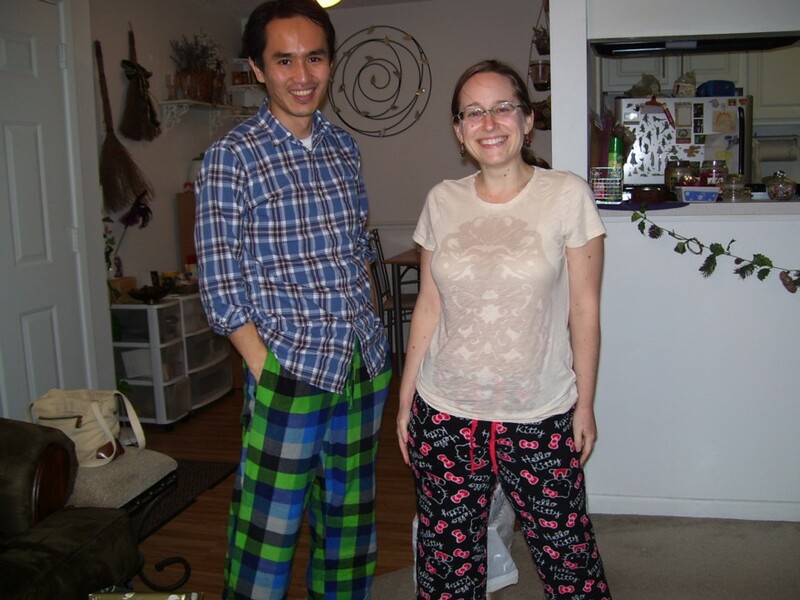 Yusuke and Patricia got cozy pants from Lindsay. 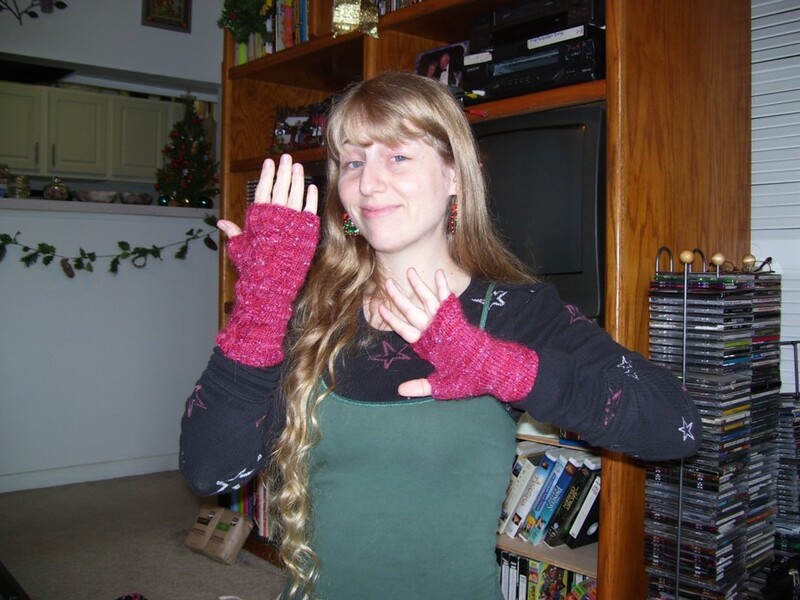 xmasbrunch6.jpg: And here's me wearing the excellent hand-warmers Patricia knitted for me. 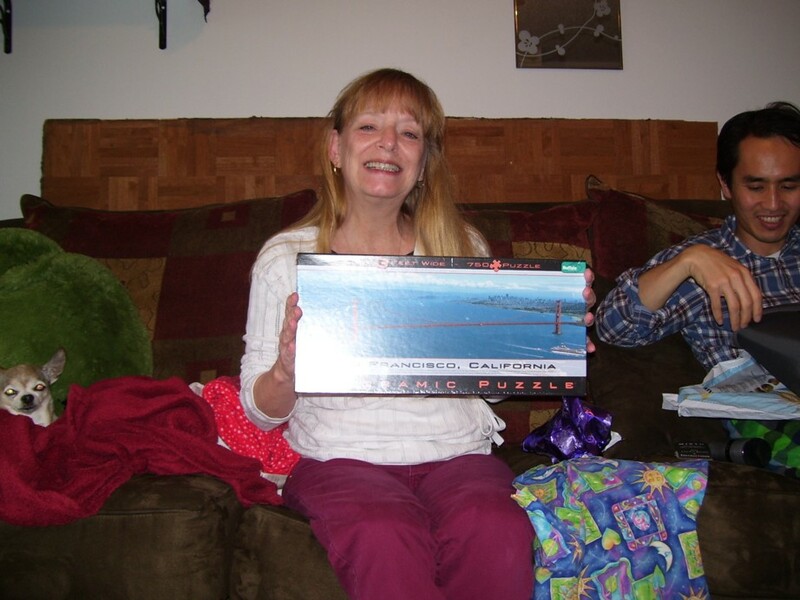 xmasbrunch7.jpg: Mommy got a puzzle. 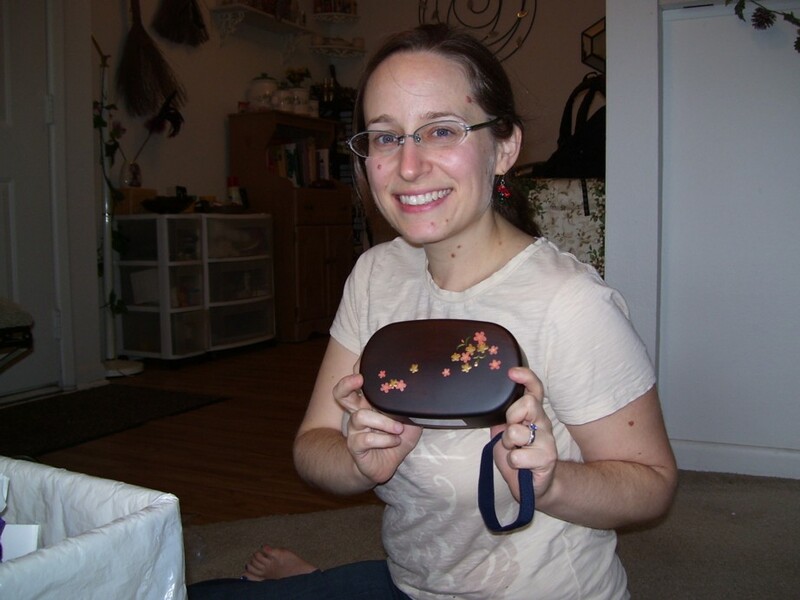 xmasbrunch8.jpg: And Patricia got a little bento box. 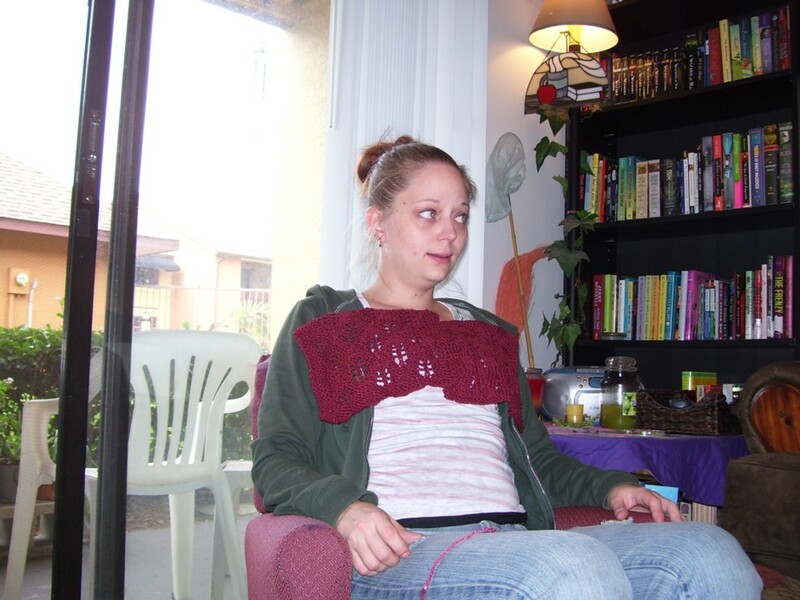 xmasbrunch9.jpg: Lindsay is "wearing" her washcloths that Patricia knitted for her. 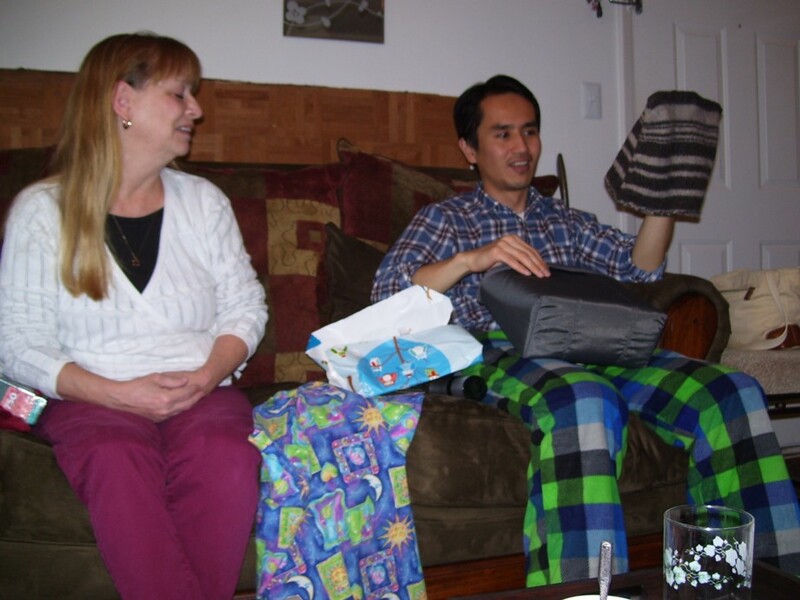 xmasbrunch10.jpg: Yusuke has just opened his gifts from Patricia--a camera bag and a knitted laptop computer case. 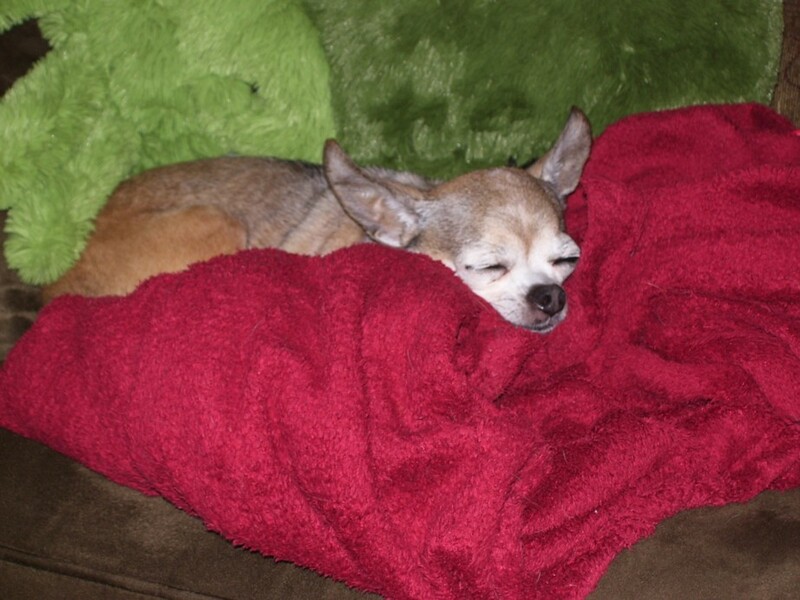 xmasbrunch11.jpg: Pork's just taking a little snooze. 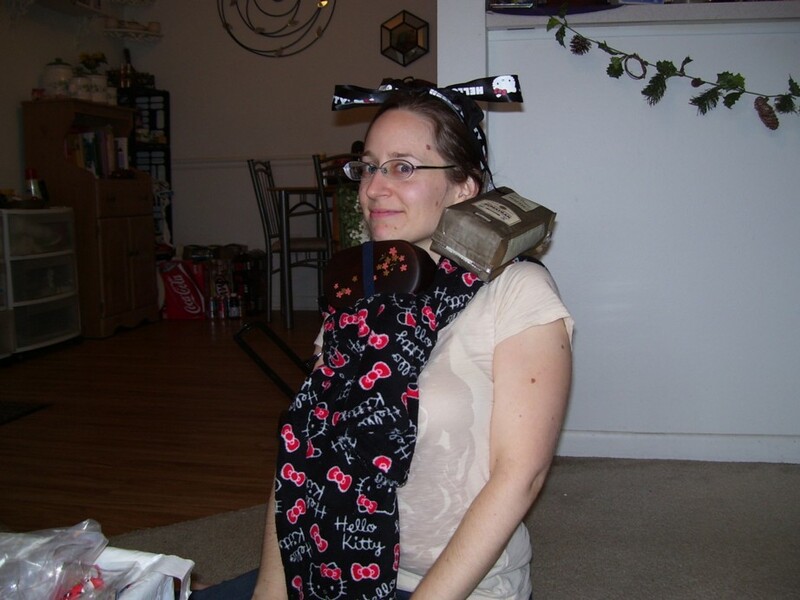 xmasbrunch12.jpg: Patricia seems to be wearing most of her gifts. xmasbrunch13.jpg: She is not normally a hammy person, but here she seemed to be lovin' the camera. xmasdinnery.jpg: That night, we had light sandwiches for dinner. 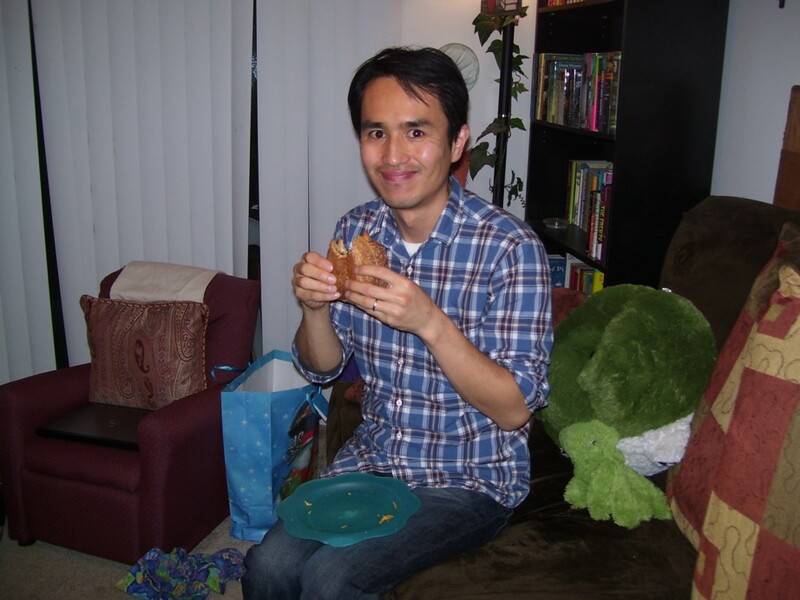 Yusuke is eating a Tofurky/avocado/hummus sandwich, I think. 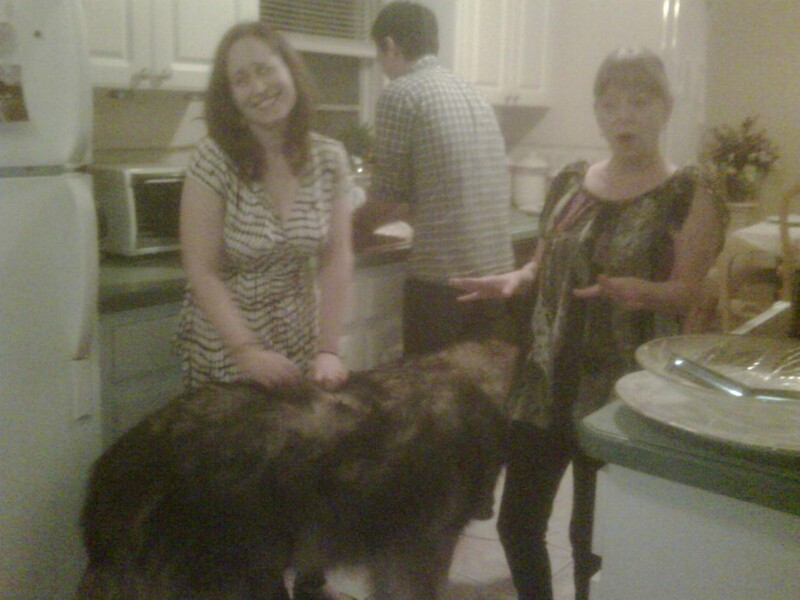 cookin1.jpg: Another night, we went to my mom's for eggplant parmesan and other great food. Patricia and Yusuke always seem comfortable helping in the kitchen. 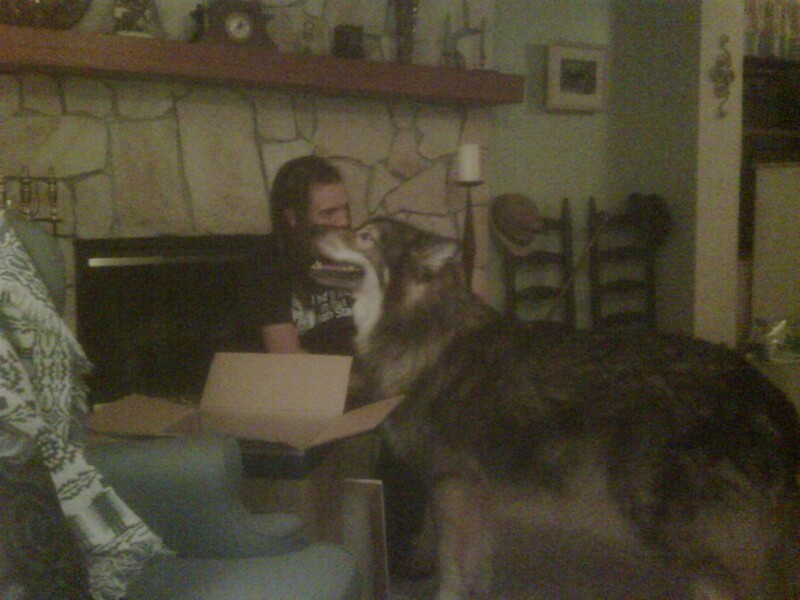 cookin2.jpg: My mom's roommate's GIANT wolf-dog Scout wandered in. Maybe he thought he would be helping? 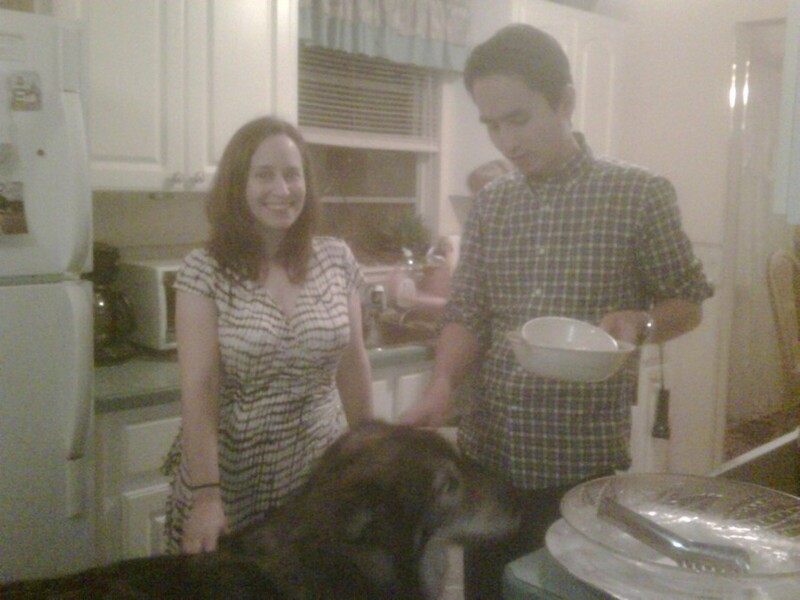 cookin4.jpg: Well if you pet him, he's going to keep helping! 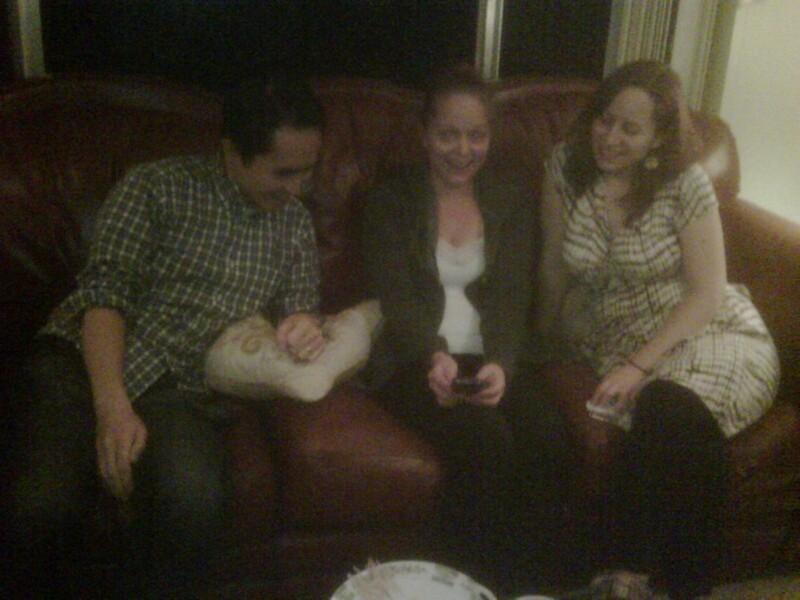 din1.jpg: Lindsay came for the family event too. Here she is with Patricia and Yusuke. dog1.jpg: Scout is the kind of dog you can't resist taking pictures of. Here he is with Lindsay's boyfriend Mike. 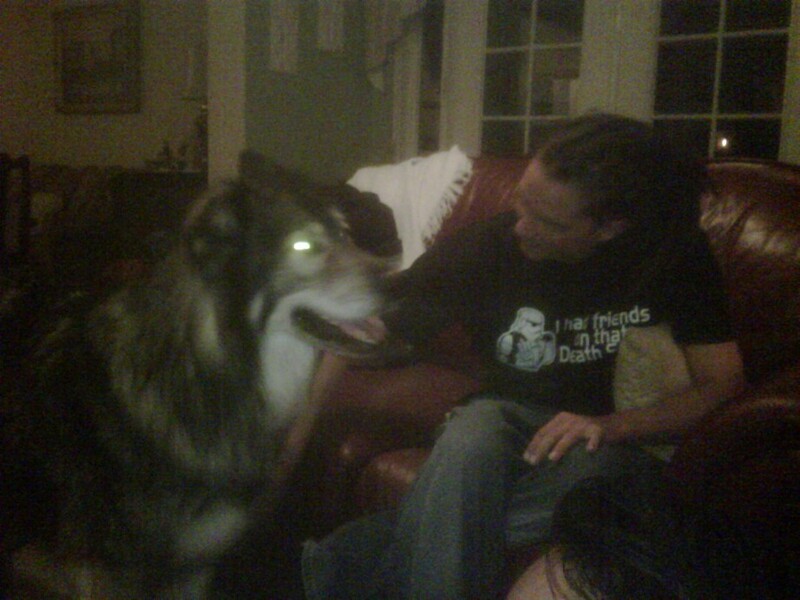 dog2.jpg: Mike's petting the doggie and his eyes are glowing in the picture. 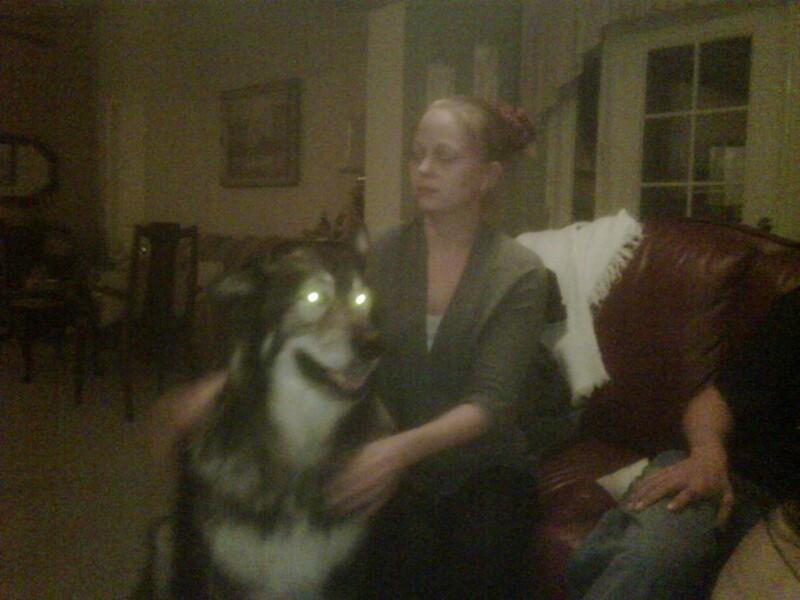 dog3.jpg: Lindsay is also in on the dog-petting action. 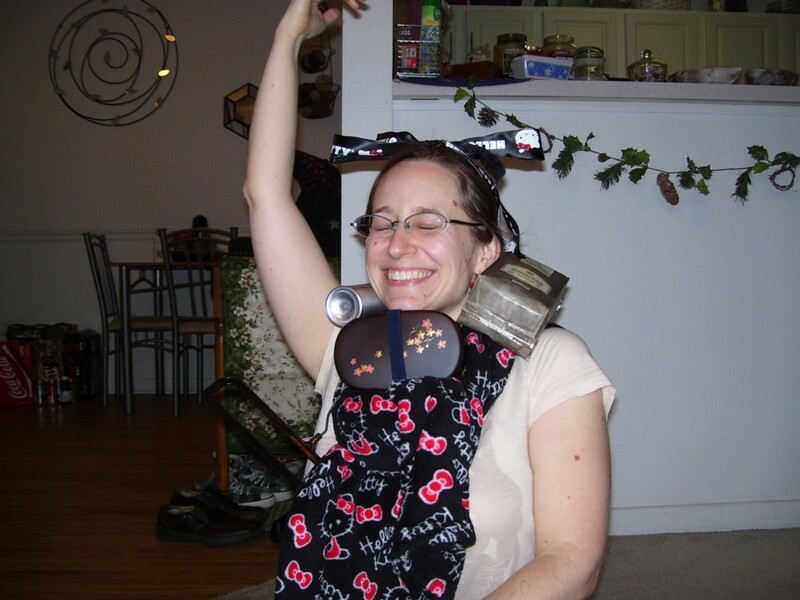 hookah.jpg: My sister smokes a hookah. 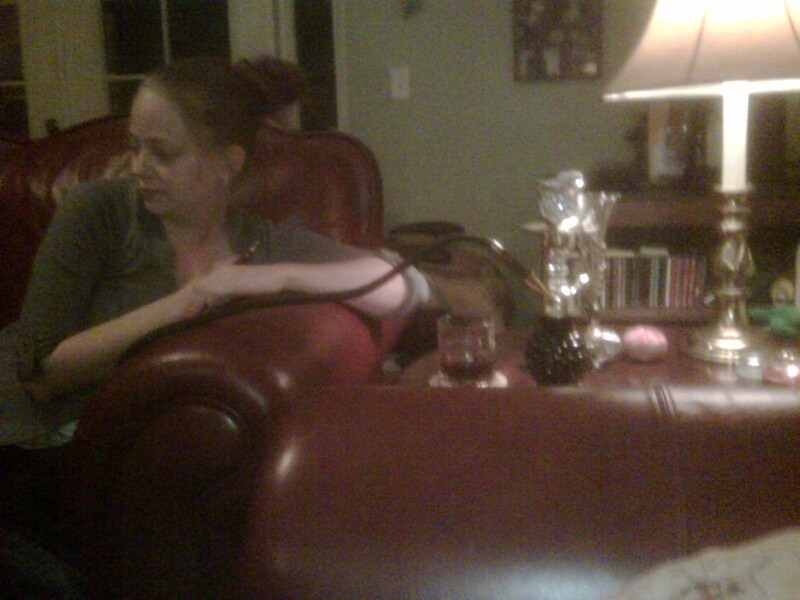 Here she is smoking my mom's. 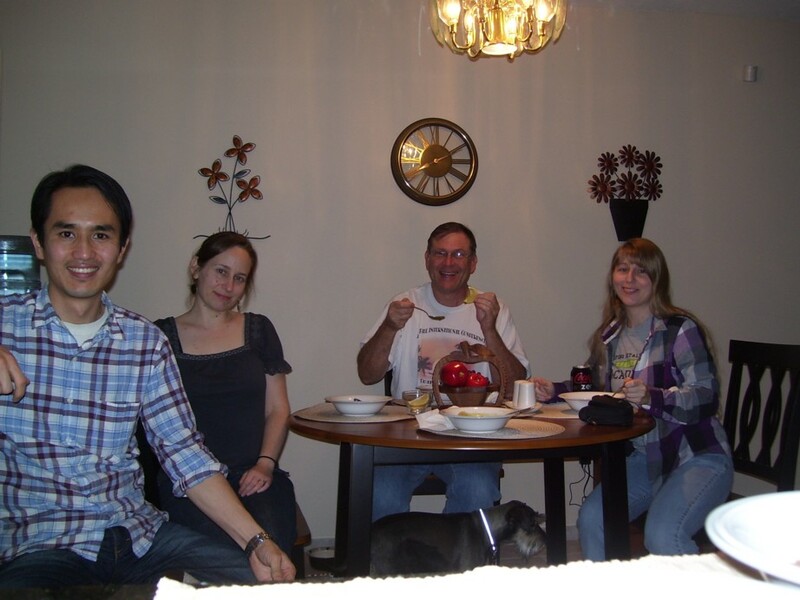 peasoup1.jpg: We also spent some time at Dad's house in Sarasota. 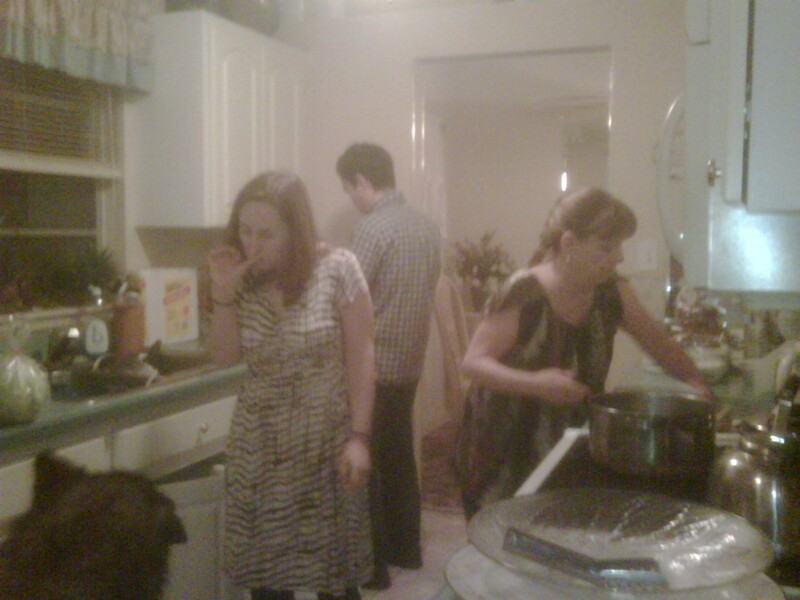 P & Y made us pea soup, and here's us about to eat it. peasoup2.jpg: Couldn't decide which family picture was better, so I'm posting both. 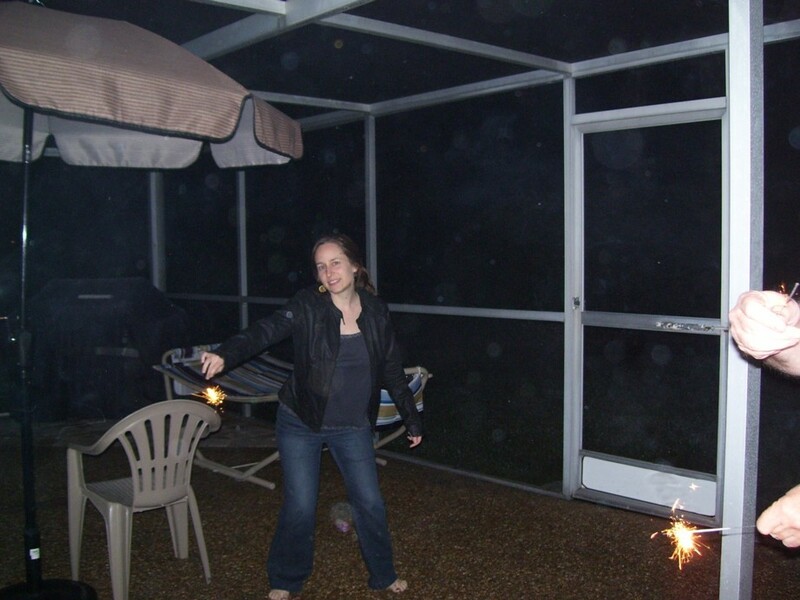 sparklers1.jpg: Our little New Year's Eve celebration involved sparklers that Daddy's dog tried to eat. 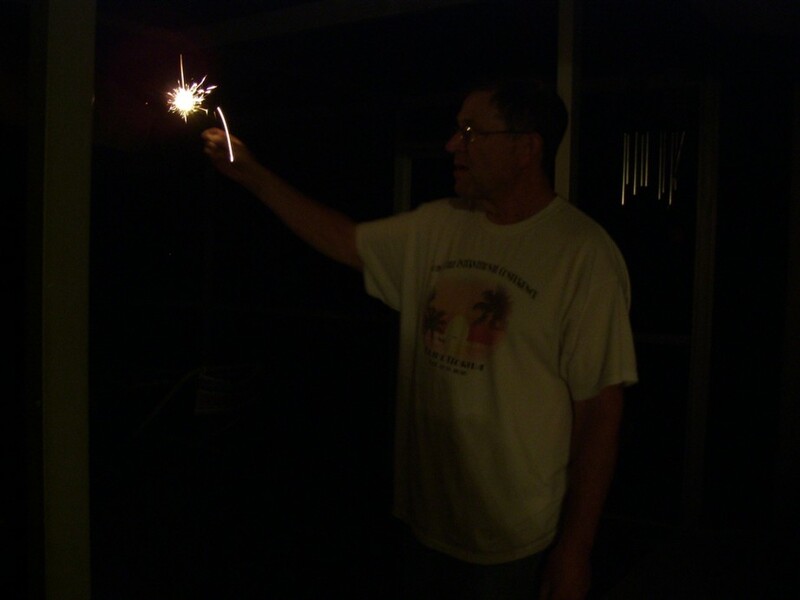 sparklers3.jpg: Daddy in the dark. newyears1.jpg: On New Year's Day, we visited my grandparents for an evening meal. This is Patricia and Yusuke at their house looking cute. 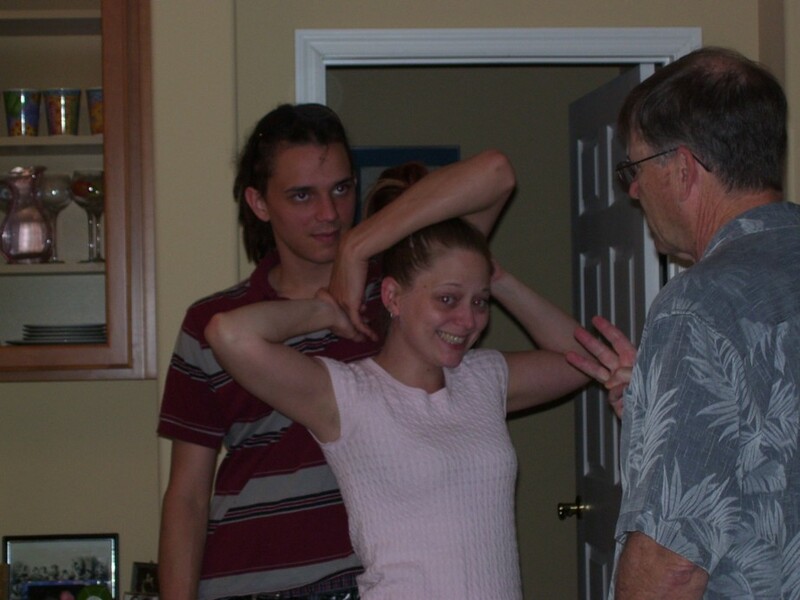 newyears2.jpg: Lindsay and her boyfriend Mike do "cute" in a slightly different way. 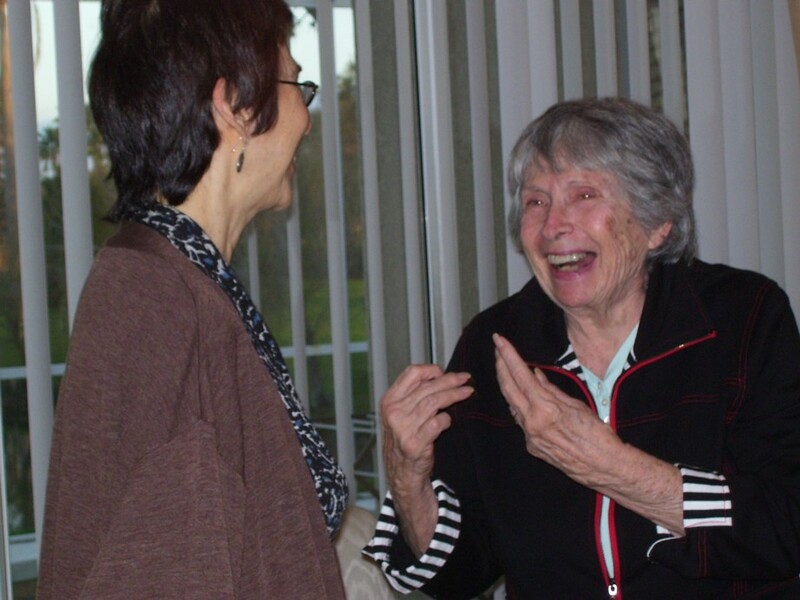 newyears3.jpg: And here's Grandma laughing with my aunt. Hopefully I won't have to wait a year to see my Californian sibling again!